As a limited-time special, Domino's is offering the new Cal'z hot dog-stuffed calzone as well as a hot dog-topped pizza over in France. 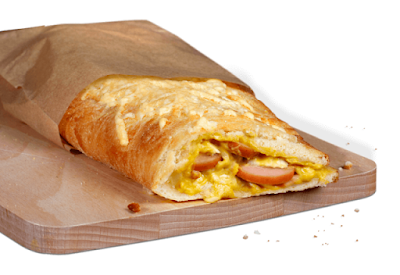 The limited-time Cal'z Hot Dog features a filling of mozzarella, sliced hot dogs, and yellow mustard wrapped in dough and baked. The chain is also offering a new Hot Dog Pizza that comes topped with yellow mustard sauce (rather than tomato sauce), mozzarella, sausages, pickles, crispy onions, and a drizzle of barbecue sauce. You can also get the pizza with a hot dog-stuffed crust. Embracing the American theme, Domino's is also serving a Burger Pizza. It features tomato sauce, mozzarella, seasoned beef meatballs, onions, pickles, tomatoes, and a drizzle of burger sauce. The hot dog-stuffed crust is also available for the Burger Pizza (as well as any other pizza on the menu). If you want to get more creative with either pizza, some of the more interesting topping options at Domino's in France includes dried figs, honey, potato, and salmon.